Popping in a new head unit is one of the easiest upgrades you can do to your car, so it's a terrific place for an inexperienced do-it-yourselfer to start. A new stereo can improve the performance of your car audio system, give you access to all the HD radio channels in your area, or even add a satellite receiver, DVD player or a number of other fun options. It's pretty easy for a car audio upgrade to snowball into a huge job, but if you're just replacing an old unit with a new one, it's usually pretty straightforward. Before you get started, it's important to make sure you buy the right new head unit and have the necessary tools on hand. The most vital factor is that you need to buy the right size replacement car radio. This is why it's so important to understand the difference between single DIN, double DIN, and DIN-and-a-half. If you make sure that your new car radio has the right features, and that it will actually fit in your car, then you'll avoid a lot of headaches later on. Flat blade and Phillips head screwdrivers. Pry bar or prying tool. Soldering iron or crimping tool and solder or crimp connectors if you don't have a wiring harness adapter. The specific tools required to install a car radio can differ from one car to the next, so take it slowly. If something seems stuck, you may need a different tool. Never force anything, or you may end up breaking an expensive trim piece or mounting bracket. In most cases, you will find that the fasteners that hold your car radio in place are hidden. This is an aesthetics thing since visible screws and bolts aren't very pretty to look at. What this means is that the first step in replacing a car radio is to expose all of the screws, bolts, or other fasteners that hold the head unit in place. In most cases, you will need to remove some type of trim piece, or trim pieces, to access the fasteners. These trim pieces sometimes pop right out, but many of them have hidden screws behind the ashtray, switches, or plugs. After you have removed all of the screws, you can insert a flat blade screwdriver or prying tool and attempt to pop the trim piece off. Never force a trim piece, faceplate, or other plastic dash components. If it feels like the component is bound on something, it probably is. Carefully examine the area where it is bound, and you will probably find a screw, bolt, or other fastener. Some radios are held in with other methods. OEM Ford head units are sometimes held in by internal clasps that can only be released by a special tool. Once you have successfully removed all of the fasteners that hold the trim or bezel in place, the trim, or bezel should be loose. However, it may still be connected to components under the dash. In some cases, you might have to disconnect various switches, and it's vital not to yank out the wires. Some vehicles also have climate controls that are connected to rods, vacuum lines, and other components. If you damage these components by pulling too forcefully, the heating, ventilation, and air-conditioning may not work properly when you reassemble everything. After you have unplugged all the switches, you should be able to pull the trim or bezel free. With the head unit fasteners exposed, it's time to actually remove the car radio from the dash. Some original equipment (OE) head units are held in with screws, but others use bolts, Torx fasteners, or a proprietary fastening method. 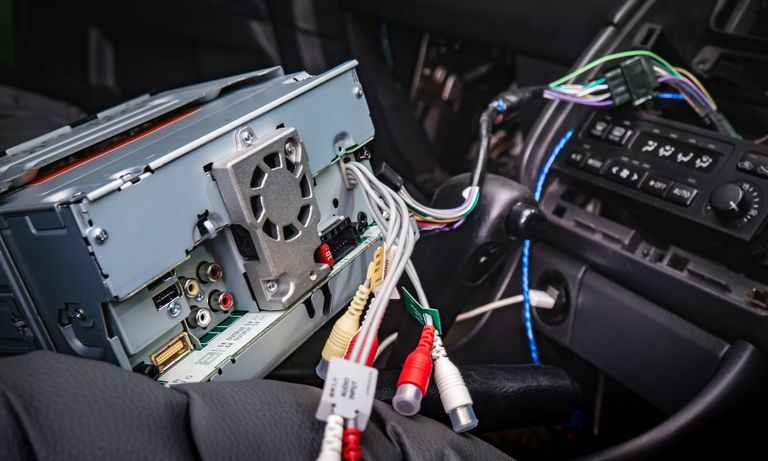 In this vehicle pictured above, the stereo is held in by four screws, so the next step is to remove them, place them in a safe location, and then carefully pull the head unit free of the dash. Factory car radios are often held in place with elaborate brackets, and you may or may not have to reuse the bracket when you install your new radio. In the vehicle pictured above, the factory stereo is connected to a large bracket that includes a storage pocket. The bracket and the space in the dash are capable of holding a much larger head unit. Since we are replacing a single DIN head unit with a new single-DIN head unit, we will reuse both the bracket and the storage pocket. If we were installing a larger head unit, we would remove the pocket and possibly not use the bracket at all. If your car has a bracket like this, you'll need to determine whether or not your new head unit needs it. You may be able to install a double DIN head unit, or you may find that you have one of the few vehicles designed for a 1.5 DIN head unit. Most aftermarket stereos come with a universal collar that will work in a variety of applications. These collars can often be installed without additional mounting hardware because they have metal tabs that can be bent out to grip the sides of the dash receptacle. In this case, the single DIN collar is too small to fit directly into the dash, and it also doesn't fit inside the existing bracket. That means we won't be using it. Instead, we'll simply screw the new head unit into the existing bracket. Note that the existing screws may not be the right size, so you might have to make a trip to the hardware store. The easiest way to install a new car radio is to use a replacement head unit that is compatible with the existing wiring harness plug. This limits the number of head units you can use, though. In the vehicle pictured above, the plug and connector clearly don't match. There are a few different ways to deal with that situation. The easiest way is to buy an adapter harness. If you find a harness that's designed specifically for your head unit and vehicle, you can just plug it in and go. You may also be able to find a harness that you can wire into the pigtail that came with your new head unit. The other option is to cut off the harness that was connected to your factory radio and wire the aftermarket pigtail directly into it. If you choose to go that route, you can use either crimp connectors or solder. The fastest way to connect an aftermarket pigtail to an OE harness is with crimp connectors. You simply strip two wires, slide them into a connector and then crimp it. At this stage, it's vital to connect each wire properly. Some OE head units have wiring diagrams printed on them, but you may need to look one up to be sure. Every OE has its own system for speaker wire colors. In some cases, each speaker will be represented by a single color, and one of the wires will have a black tracer. In other cases, each pair of wires will be different shades of the same color. Aftermarket car radios use a fairly standard set of wire colors. If you are unable to find a wiring diagram, a test light can be used to identify the ground and power wires. When you locate the power wires, make sure to note which one is always hot. You can also determine the identity of each speaker wire with a 1.5v battery. You will need to touch the positive and negative battery terminals to different combinations of wires. When you hear a slight pop of static from one of the speakers, that means you have found both of the wires that connect to it. Once you have your new car radio wired in, you will need to gently place it into the dash and turn your ignition to the accessory position. Verify that the radio works. If it doesn't, double check your wiring job. After you are satisfied that your new radio works, you're in the home stretch. All of the tough parts are behind you, and all you have to do is simply reverse the removal procedure. In most cases, finishing the job is just be a matter of screwing the new head unit in place, popping the trim piece back on, and cranking up your brand new stereo.